My youngest daughter Megan does not have a very varied diet and is very particular about what she eats and often quite stubborn. I have recently started cooking with her which I hope will encourage her to at least try a greater variety of foods. On Saturday I stopped at the fruit and veg market stall in Ampthill. 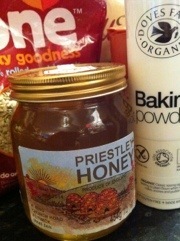 Here I found some local honey called Priestley Honey that is made in Flitwick. The idea that the honey was made from bees which may have visited our garden made it appealing to both myself and my daughter Megan. One of the things I want Megan to get an understanding of is what goes into the food we eat. 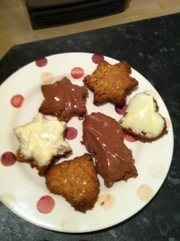 In order to do this I made Chocolate Digestive Biscuits with her. At some point we will make them again. Then we will look at our recipe and the ingredients in a common brand as listed on their label and perform a taste test to see which we prefer. I hope that our Priestley Honey Digestive Biscuits will win the taste test. Although my grandfather kept bees I am actually not that fond of honey but the way the Priestley Honey dripped of the spoon was quite wonderful and almost tempted me to eat it directly from the spoon. Honey itself contains antioxidants, has anti-bacterial properties and for many years has been included as part of a number of natural remedies. The most commonly known probably being its use as a cure for a sore throat. 2. Melt the butter in a small pan on the hob and add in the water and honey and stir together. 5. Retrieve from fridge and roll mixture flat on board. 7. Cook in oven at 200 for 15mins or until golden brown. 8. Dip in melted chocolate if desired. Megan’s were a huge success and came out looking like this. They are very sweet crunchy oat biscuits. Enjoyed this post? Why not leave a comment? This entry was posted in Uncategorized and tagged Biscuit, Organic, Recipe by fiona. Bookmark the permalink.